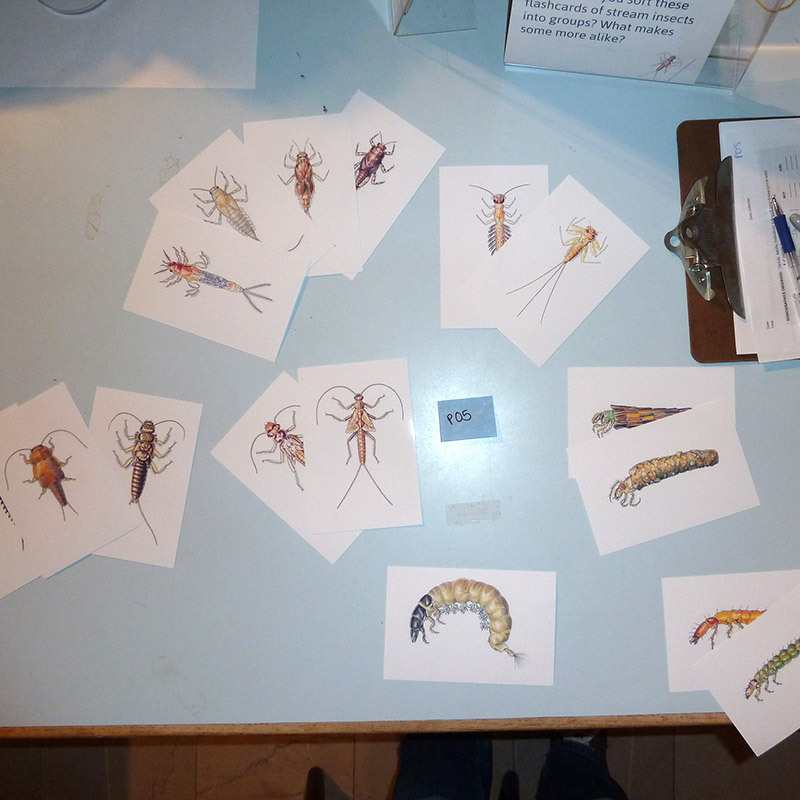 On Sunday afternoon (3/10/13) we packed up some bugs and flashcards and headed to the Carnegie Museum of Natural History to see how novice users observe and sort insects. 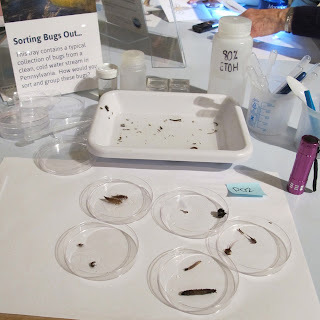 We set up three stations, one to sort flashcards and another to sort preserved insects and asked each participant or group of participants to sort them into groups, and a final activity to observe and describe one insect as thoroughly as possible. Participants thought aloud as the worked at each station so we could understand the process they were going through. The activities were coded by moderators as participants completed the tasks, and results were complied after the study completed. 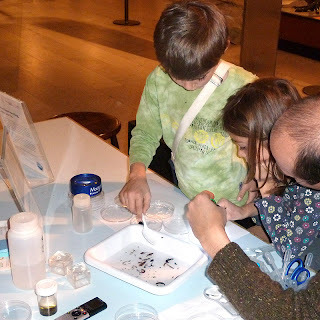 We had 12 groups of particpants that were usually made up of two-three siblings and one or two parents/guardians. Participants ranged in age from four to their early-twenties (not including parents). Overall, we think the study was a success, we learned a lot about how novice users, especially children observe insects and what characteristics they are likely to notice first. 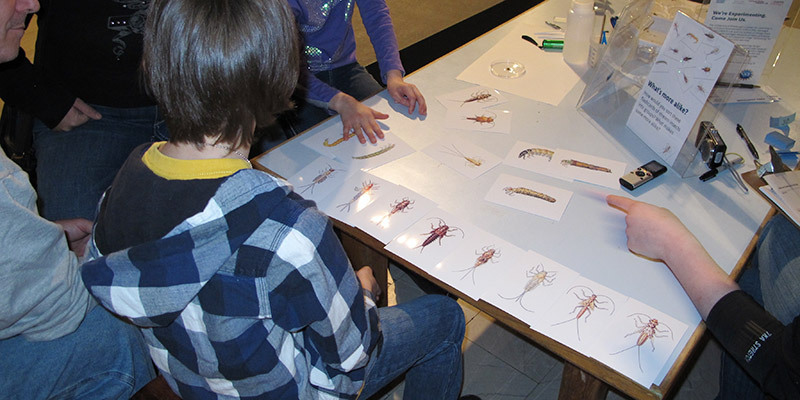 There was a noticeable difference between how participants sorted preserved insects and how they sorted the cards. We hope that our tool with gigaMacro images of preserved insects can help bridge the gap between real insects and idealized illustrations. 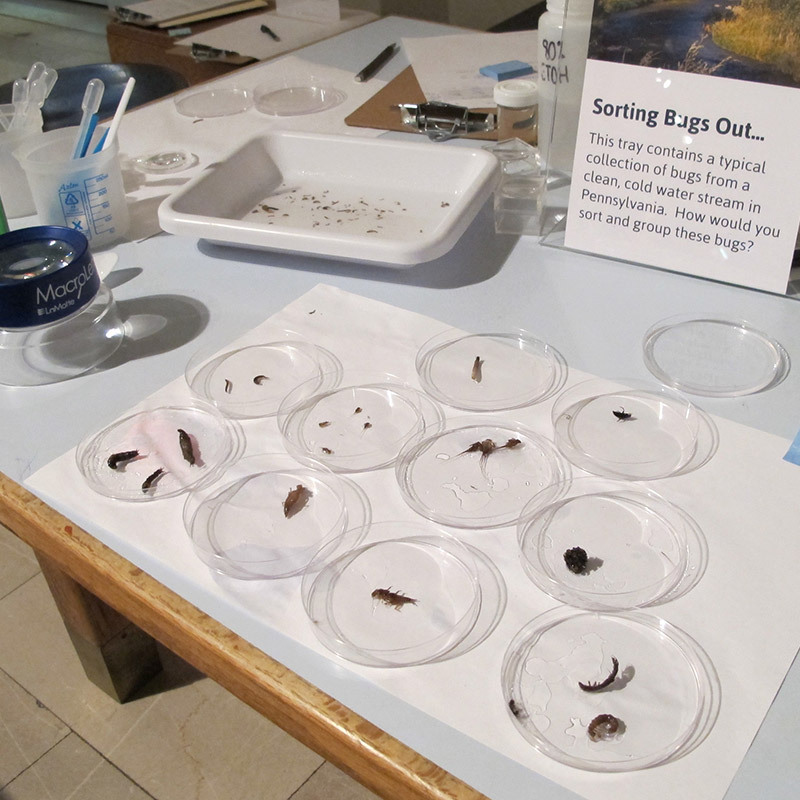 During the first activity participants were given a variety of aquatic macroinvertebrate insects (20-30 preserved specimens) loose in a tray, and asked to sort the bugs into like groupings using the tools and containers provided. When they completed the task, they will be asked to put more like groupings together, and describe how they arrived at their final sort. Kids had a lot of fun with this activity, even those who were initially scared or grossed out by the insects quickly jumped in when they saw their siblings taking part. Most participants created about 5 or 6 groups with a few below and above. 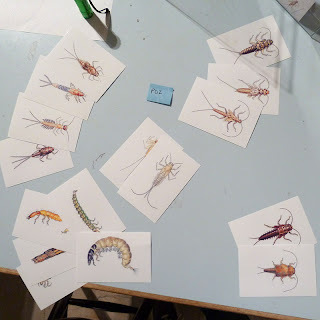 Participants will be given 20 illustrated flashcards of EPT (mayflies, caddisflies stoneflies) insects and asked to sort these insects into groups of similar kinds. Participants were given no guidance by the moderator and asked to talk aloud as they sorted. Unlike activity one, participants moved very quickly though this activity, usually spending no more than three or four minutes at the station. 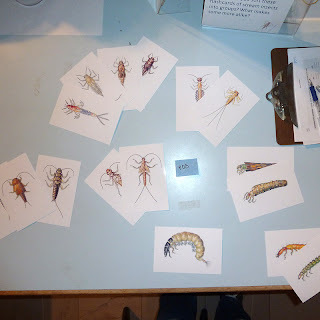 Despite this, they were making good observations and creating 4-6 groups of flashcards. 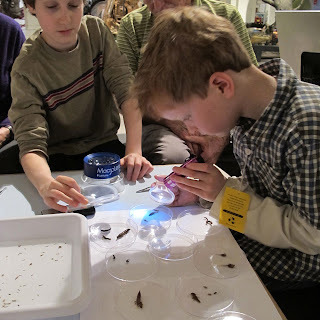 The plan with activity 3 was to give participants a pre-selected insect with a ‘macro’ magnifying lens and asked to describe the insect to ‘someone over the phone’ who can’t see it. However, after testing the activity two or three times we realized that novice participants, especially children were not noticing any characteristics other than those they called out in activity two or three. We decided to discontinue this activity because it was not providing any additional information, and participants did not find it very engaging. 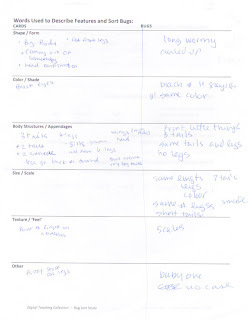 Each of the participants had one coding sheet that was used for both activities. 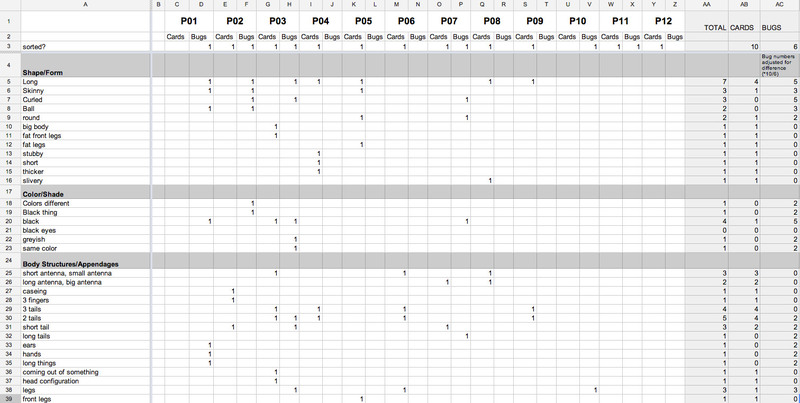 The descriptors they used in each activity were written down in different columns, and after the study was complete, data was entered into a spreadsheet and compared across participants.